I was actually typing up a different blog post when I realized that this weekend marks our three-month anniversary in Oslo. So while I do look forward to posting about some toddler-friendly day trips from Prague soon, I thought now would be a good time to share some of my thoughts on Norway three months in. 1. They are obsessed with summer. I suppose that this shouldn’t come as a surprise given that it is cold 8+ months out of the year and Oslo can get real snow as late as May, but the Norwegians have a unique affinity for summer. “Summer food” (“sommermat”) made sense to me since there is more variety and better flavors during this time of year than any other. But “summer coffee”? Yup. And we aren’t just talking about iced coffee. There are actually special coffee blends for summer. I suspect they are lighter and fruitier to go along with the season, but Having never actually tried it, I’m not sure. 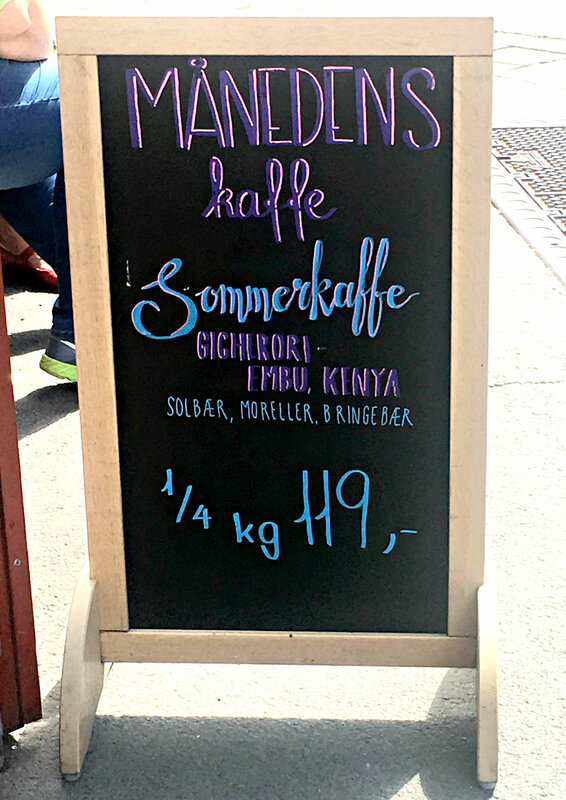 But all of June I laughed as I walked past Kaffebrenneriet each day and saw its sandwich board announcing sommerkaffe’s arrival. Now it’s your turn. What would surprise a newcomer about your city? We moved to Germany a year ago, and I think most non-Germans assume all of the country is like Bavaria (Lederhosen, beer, etc) but it’s so different region to region. About my Canada – so many misconceptions! Not all of the country is covered in snow in winter, we don’t live in igloos, we don’t all know each other etc etc! What a minute. Do people seriously not understand how big Canada is? How could you possibly know everyone? What part of Germany are you in? I am really only familiar with Bavaria, so I’m sure I share many of the common misconceptions! I miss proper recycling so much here in Norway! In Tromsø we had to put our paper trash in plastic bags (please explain that logic to me) and here in Stavanger it more or less all goes into the same bin. So different to Germany where you can get fined for not recycling properly!